This powerful 7″ IPS display Tablet is at an incredible price. If you’ve been toying with the idea of getting a Fire Tablet, now is the time to jump on in. It now comes with the Alexa cloud-based voice service that you just press and ask. You can enjoy movies, TV shows, music, Kindle eBooks, apps and games. Prime members get unlimited access to a large selection of music, books, videos and more. The battery life is up to 7 hours. The Fire Tablets were built for entertainment. Now with Alexa, there is absolutely no limit to the amount of fun you and your family with have with this outstanding tablet. Click the image to the right and discover what Fire Tablets are all about. I can tell you all day long the great things about this product, but you need to see for yourself. So, click the image to learn more. Let’s have some fun with your Easter Egg decorating. How about dressing your eggs to look like Minions? And creating your own Minion in the process . . . Sound like a good idea? 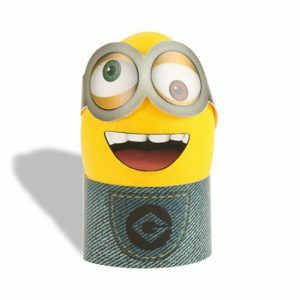 Change up the eggs and the mouth — add hair and go a bit crazy with different ways you can create a minion of your very own. I have a PDF of the various parts, hair, eyes, mouth, overalls that you can print out on your personal printer, cut out and allow the kids to have some fun. Just click the little minion on the right. But, this is only the beginning! Add some bits and pieces of colored card stock and design different hair styles and a different outfit than overalls. Use your imagination and allow the kids to get into this activity as well. I know it’s last minute, but most of us die our Easter eggs the night before . . . but you may have them already done. Just play with some of the yellow ones . . . or get some plastic eggs and dress them up — after you fill them with sweet treats. I thought it would be a bit of fun! But look what I’ve found!!! Disney’s Mickey and Minnie are always a favorite. Click the image to the left to be taken to the PDF to download and print out, cut out and wrap around your Easter Eggs. Now, you have a bit of a decision to make . 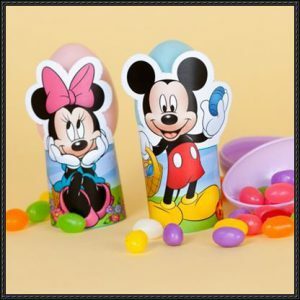 . . create your own minions or use these Mickey and Minnie wrappers . . . or maybe do both . . . or put Mickey ears on your minions . . . or Minnie’s bow . . . or Mickey’s pants . . . You may be able to have a bit of fun with these. I’m sure you can think of other variations that would work well with your creative endeavor. Heather has come through with some interesting crafts. In a previous post, I showed you Heather’s Simulated Window and Lantern. She had promised her Easter Eggs and here they are. I’ll allow the pictures to speak for themselves. You can get some plastic eggs and let your imagination soar. You can go shabby chic or bling them up however you like. Just gather up a variety of odds and ends and have at it. Add flowers and lace . . . get images and decoupage them. It is possible to create lovely eggs to give as gifts or decorate around your house. A few of these would definitely brighten up different areas of your home. 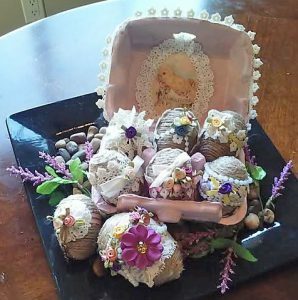 Isn’t it clever of Heather to use the egg carton, trim it with lace and decoupage a lovely picture on both the inside and outside of the lid and add a lovely lace ruffle around the image (both inside and out). I would personally find it difficult to put these away after Easter. I think they would look lovely throughout the spring and into the summer. 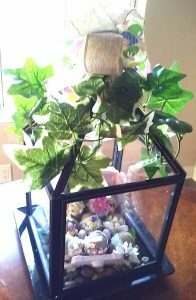 And, Heather did a wonderful job with a lantern in which to display the eggs. I’m inspired to get to work. How about you? 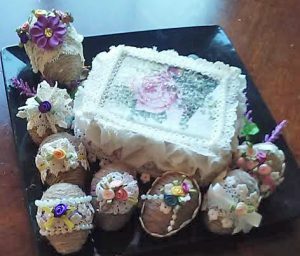 As you can see, the eggs appear to be wrapped initially in twine and from there Heather went to work with pearls, flowers, lace, ribbon and whatever bits and pieces she found to make each and every one of her Easter eggs into a breathless work of art. You can do the same . . . and for the lantern . . . get some picture frames together and create to your hearts content to create the right shape you desire. Then add the greenery and some burlap lace and you have a lovely display case for your treasured crafts. With a little bit of inspiration . . . you’ll be amazed by what you can make. My personal thanks to Heather for sharing her Easter craft projects with us. This happy Easter bunny is a great craft for you to do — you may have just enough time to make a few for family and friends. I love how these 3D models are created and then put in PDF form in order to share with others. 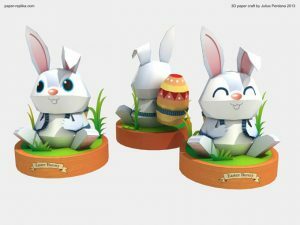 Paper-Replika.com is the source for this adorable bunny, The PDF comes complete with all the pieces you’ll need to make one of your own. You can, of course, add your own embellishments to make it more personal for you or for the person who may receive it. I think it’s fine the way it is, but for those who live on the beach, it may be fun to add some shells . . . you can add flowers and maybe some little trinkets to bling it up a bit. The finishing touches will make it unique and more personal. I do like it and recommend that you click the picture to the right to be taken to the Paper-Replika website so you can get to the PDF to print it out and assemble. Since my printer is on the fritz right now I’ll have to wait for my replacement printer, but I’ll be sure to print this out as soon as my new printer is set up. But, just in case it isn’t, I did a bit of looking around and I found this great Tree House. I don’t know about you, but a tree house has always been something I wanted to have. Now since I won’t be building one to use in my backyard, I thought a paper craft one would be fun to have. You can click this tree house picture to the left and be taken to the Paper-Replika website where you can download it. 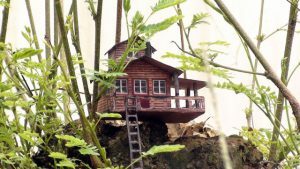 I do like the way Julius Perdana, the creator of these paper crafts, put the tree house in a wooded area with rocks. It does look like a cabin in the woods and a tree house seems to be a natural for that setting. As with the bunny paper craft, you can add your own finishing touches to this tree house to make it fit your ideal — or the one you did have as a child or the one you will make for your children in your own backyard. Well, bunnies, tree houses and spring all seem to go together. I do hope you’ll visit Paper-Replika and take a look around. I’m sure you’ll find something you like. Thanks for stopping by and my personal thanks to Julius Perdana at Paper-Replika for these great paper crafts I found. 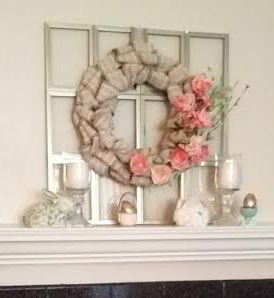 This is my friend Heather’s beautiful wreath she made with a picture frame simulated window as a lovely background. It looks like Heather has already decorated for Easter. This will look lovely all spring. She’s working on some shabby chic eggs she’ll share once they’re completed. Makes you want to get crafting, doesn’t it? 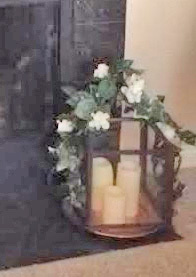 The Lantern is quite a lovely statement on the hearth of the fireplace. With the candles, it definitely makes a statement. Well, I hope Heather doesn’t mind that I had to cut up her picture, but I thought it necessary to get a good look at the wonderful crafts she created from picture frames. This lantern would definitely work out well for all seasons. I never would have thought of making such love things from picture frames. That’s why I have clever friends who get inspired while shopping for bargains. I’m looking forward to seeing Heather’s shabby chic eggs. I’m going shopping for picture frames, flowers and other craft items to see if I can create something as lovely. When it comes to great prices, you can’t beat the bargains at the places Heather shops. My special thanks to Heather for sharing her delightfully lovely creativity with us.